. 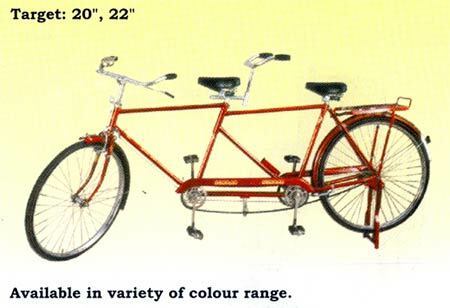 :: SOHRAB :: Pakistan's No 1 Bicycle ::. High quality steel Tubing (EWR) brazed. Single piece Head Tube, Steel pressed, B.B Shell, Oval Seat stay and chain stay. Swaged Taper Fork Blades with integral fork ends, Raleigh Type, steel pressed Crown reinforced Steering column, CO2 welded. West wood from 28*1-1/2, Front wheel 32holes. Rear wheels 40 holes. 3/8� spindle Rear Hub and 5/16� spindle font hub. Raised pattern 3� lug, Double levers, Bright duplex Nickle chrome plated. Rectangular Section 7� size crank cotter type 1/8�*36 teeth chain wheel CP with special free wheel (Rear Side). 1/8�*1/2�*114 links and special arrangement for chain Tension. Quarter chain cover special (Front), Quarter Chain cover standard (Rear). Front 36*36 teeth, Rear 18*48 teeth. Spindle Rubber Moulded, threaded on the Dust Cup. Steel Frame with P.U. Moulded, Top Diamond Cut. Stirrup Type front and Rear level Brake. Rear Stirrup Center pull Type.